Parisius & Maguncia. [Paris & Munich] Folio XXXIX - SCHEDEL, H.
Title : Parisius & Maguncia. [Paris & Munich] Folio XXXIX. Size : 14.2 x 9.1 inches. / 36.0 x 23.0 cm. 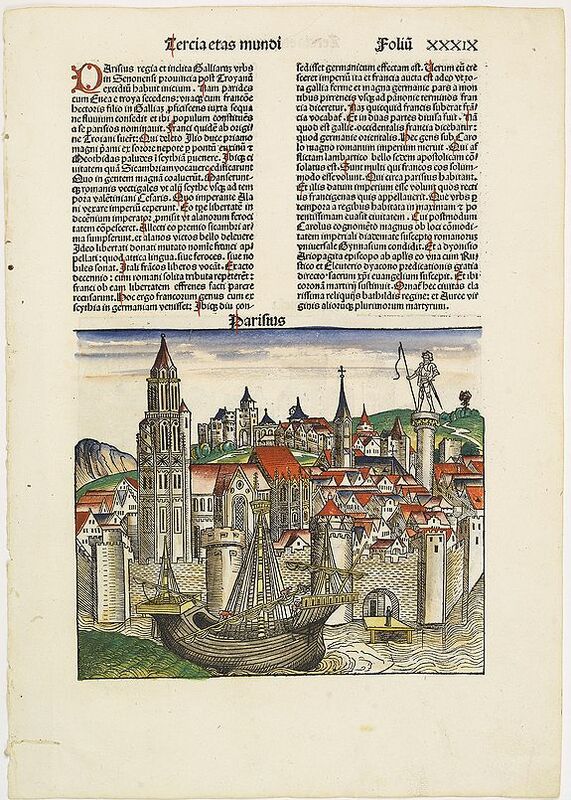 Description :Imaginary view of Paris and on verso Munich : however the earliest obtainable views of this period. In the forground a large vessel, who was the symbol of the powerful corporate body of the Marchands de l'eau, and is dating back to the Middle Ages. The city motto, "Fluctuat nec mergitur" ("It is beaten by the waves without being submerged") is equally a reference to this vessel. The first mention of coat of arms of Paris with the vessel appears as early as 1190 when Philippe Augustus gave the design to the city, shortly before embarking to the Holy Land. Condition : Wood cut. Some marginal minor age-toning on the outer left hand margin. Size of illustration 229 x 197mm.